Moonlight Wolf Oil Painting. Artist : Frederic Remington. 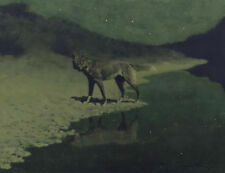 Title : Moonlight Wolf. Dance & Music. Photo to Painting. About Photo to Painting Work Examples Get Started. ToPortraits is your one stop source for exquisite oil painting reproductions. He also wears moccasins. Mounted on his horse, he turns his head toward the sky and holds up a feather. Frederic Sackrider Remington (October 4, 1861 – December 26, 1909) was born in Canton, New York in 1861 to Seth Pierrepont Remington (1830–1880) and Clarissa "Clara" Bascom Sackrider (1836-1912). Frederic Remington was related by family bloodlines to Indian portrait artist George Catlin and cowboy sculptor Earl W. Bascom. This is the one of the most recognized bronze statues in the world and one of very few originals is in the Oval Office of the White house. Note the detail in this bronze and compare it to anything out there. Once Remington started using the lost wax casting process he realized how easy it was to manipulate each individual wax to his liking making each casting with different characteristics. 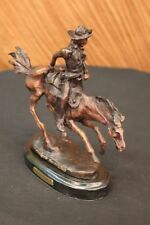 This sculpture is mounted on a black marble base and is signedFrederic Remington. The Arizona Cowboy bronze statue, inspired by Frederic Remington, is handmade and cast in the traditional Lost Wax Casting Process. This is a multi step process that insures a quality bronze sculpture that may be passed down from generation to generation. A seasoned trooper cowboy is casually patrolling the area. He and his loyal horse gallop through the open dry plains. A long rifle is slung to his side. It features the signatureFrederic Remington. Title:His First Lesson. HIGH Quality Oil Painting on Canvas,Genuine 100% Hand Painted. Can't find the right painting you like ?. We can do any painting for you. We are always happy to wait longer! Cheyenne Bronze Metal Sculpture by Frederic Remington Western Decor 17" x 19"
The careful details can be seen in the cut of the horse's strong legs and the glare in its face. Condition: This sculpture is in a perfect condition. Weight : 22 LBS. Height without base: 16". The careful details can be seen in the cut of the horse's strong legs and the glare in its face. Condition: This sculpture is in a perfect condition. Once Remington started using the lost wax casting process he realized how easy it was to manipulate each individual wax to his liking making each casting with different characteristics. This sculpture was cast using the ?. He sits high and thrusts a scalp into the air. It features the signatureFrederic Remington. Condition: This sculpture is in a very good condition. The careful details can be seen in the cut of the horse's strong legs and the glare in its face. Height without base: 16 ". to size and weight. The careful details can be seen in the cut of the horse's strong legs and the glare in its face. Weight : 22 LBS. Height without base: 16 ". A long rifle is slung to his side. It features the signature Frederic Remington. Condition: This sculpture is in a perfect condition. Height without base: 13" Weight : 22 LBS Inventory:31-4650570M9464 SALE. ~ Hot Cast Bronze Frederic Remington Native American Indian Warrior on Horseback ~ Thank you for your interest in my pieces. All of my pieces are made from real 100% hot cast bronze, using the lost wax method. This is a gorgeous 100% real bronze on real marble sculpture by Frederic Remington. Aptly named "Warrior", in this sculpture a Native American Indian warrior sits on the saddle of his galloping horse, charging into battle brandishing a spear in his right hand. This sculpture is mounted on a marble base. This piece is signed "Frederic Remington". Size (with base): 9" x 8" Marble dimensions: 6" diameter Bronze height (without base): 8" Weight: 7 lbs All of my pieces come with a 30 day full refund (minus S&H) if you are unsatisfied for any reason. This is a gorgeous 100% real bronze on real marble sculpture by Frederic Remington. This piece is signed "Frederic Remington". This sculpture is mounted on a marble base. Bronze height (without base): 9".5. And is signed Remington. Every one of the pieces are plum bronze. What is plum bronze?. It is the purest form of bronze. THIS IS A PIECE OF ARTWORK YOU CAN HANG ON THE WALL. Bronze Handmade Bronco Buster Clock. with Marble Base. A long rifle is slung to his side. It features the signature Frederic Remington. Height without base: 13". He sits on his trusted horse and wanders the land, holding a spear and prepared for any potential threats. He has triumphed over many different travelers and settlers trying to take over his peoples land and has a keep-sake from each of them. OUTLAW Bronze Sculpture by Frederic Remington 10.5" x 9"
WARRIOR Bronze Sculpture by Frederic Remington 9" x 10"
Condition: This sculpture is in a perfect condition. Bronze Dimensions with Marble Base:Height 15" x Width 18" Marble Dimensions: 14 x 8". Height without base: 14 " Weight : 23 LBS Inventory : 43-50572M8934. A cowboy charges across the dry land with his gun in the air. His horse gallops, with its nose pointed forward. The cowboy holds the reins tightly in his free hand and he squeezes his thighs on each side of the saddle so he won`t get bucked off. He is dressed in a shirt,chaps, boots and the stereotypical cowboy hat. 100% bronze and handmade, this brown patina sculpture was cast using the "Lost Wax Method" and mounted on a black marble base and is signed Remington. A seasoned trooper cowboy is casually patrolling the area. He and his loyal horse gallop through the open dry plains. A long rifle is slung to his side. It features the signature Frederic Remington. WESTERN STYLE FREDERIC REMINGTON SIGNED BRONZE STATUE " WOOLY CHAPS"
COWBOY WITH ROPE Bronze Sculpture by Frederic Remington 9" x 8"
A long rifle is slung to his side. It features the signature Frederic Remington. Condition: This sculpture is in a perfect condition. Height without base: 13". A long rifle is slung to his side. It features the signature Frederic Remington. Condition:This sculpture is in a perfect condition.